NEW YORK -- Stocks closed sharply lower Wednesday after hawkish comments from Janet Yellen boosted expectations of an interest rate hike, and oil fell below $40 a barrel. Investors also attributed late-day selling to news coverage of a shooting in southern California. The S&P 500 energy index fell 3.1 percent, leading declines in the S&P 500 as U.S. crude oil futures finished the session down 4.6 percent at $39.94. The utility index, which tends to underperform in a higher-rate environment, dropped 2.2 percent. It was the day's second-worst performing sector, although all 10 S&P sectors ended lower. %VIRTUAL-pullquote-This last down leg is related to the fact that every TV station in America is showing people getting carted off on stretchers, and no one knows why.%Record intraday highs in Alphabet, Amazon and Netflix failed to keep the Nasdaq in positive territory. The Fed chair said she was "looking forward" to a rate hike that will be seen as a testament to the economy's recovery from recession. The Fed's next policy meeting is Dec 15-16. Yellen also expressed confidence in the U.S. economy. Earlier in the day, data showed U.S. private employers boosted hiring in November. The U.S. government monthly jobs report is due Friday. "I was a little surprised she sounded as hawkish as she did given we're two days away from the non-farm payrolls report and a couple of weeks away from the Fed FOMC meeting," said Michael O'Rourke, chief market strategist at JonesTrading in Greenwich, Connecticut. 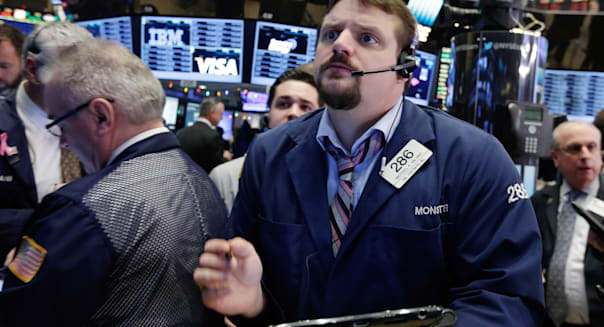 The Dow Jones industrial average (^DJI)​ fell 158.67 points, or 0.9 percent, to 17,729.68, the Standard & Poor's 500 index (^GSPC)​ lost 23.12 points, or 1.1 percent, to 2,079.51 and the Nasdaq composite (^IXIC) dropped 33.08 points, or 0.6 percent, to 5,123.22. Losses accelerated late in the session as news of a shooting in California emerged. Police searched for up to three suspects in the shooting of as many as 20 people, some of them fatally, at a social services agency in San Bernardino. "This last down leg is related to the fact that every TV station in America is showing people getting carted off on stretchers, and no one knows why," said Eric Kuby, chief investment officer of North Star Investment Management in Chicago. Yahoo (YHOO) jumped 5.8 percent to $35.65 after reports the company could sell its core Internet business. Shares of Amazon.com (AMZN) touched a record high of $684.82 before ending down 0.4 percent at $676.01. Netflix (NFLX) rose to a high of $131.35 and ended at $128.93, up 2.8 percent. Alphabet (GOOGL) rose to $793.04, but ended down 0.8 percent at $777.85. Airline shares rose after Delta Air Lines (DAL) said it earned more per mile in November than a year ago. Delta was up 1.4 percent at $48.33, while an index of airlines was up 1.1 percent. Yellen is due to testify Thursday on the economic outlook before a joint congressional committee. Declining issues outnumbered advancing ones on the NYSE by 2,434 to 649, while on the Nasdaq, 1,884 issues fell and 936 advanced. The S&P 500 posted 21 new 52-week highs and 13 new lows; the Nasdaq recorded 88 new highs and 65 new lows. About 7.4 billion shares changed hands on U.S. exchanges, above the 6.8 billion daily average for the past 20 trading days, according to Thomson Reuters (TRI) data. At 10 a.m., the Institute for Supply Management releases its service sector index for November; the Commerce Department releases factory orders; and Freddie Mac releases weekly mortgage rates.